New customers are hard to get. In fact, according to Invesp, it costs 5 times as much to get a new customer than it does to keep an existing one. But sometimes, it doesn’t matter how much we try to retain customers, some will still cancel. It’s the nature of the business. Thankfully, that’s where the “we miss you” email comes in handy. It’s a last attempt to reach those customers that canceled and say hey, remember us? We want you back. 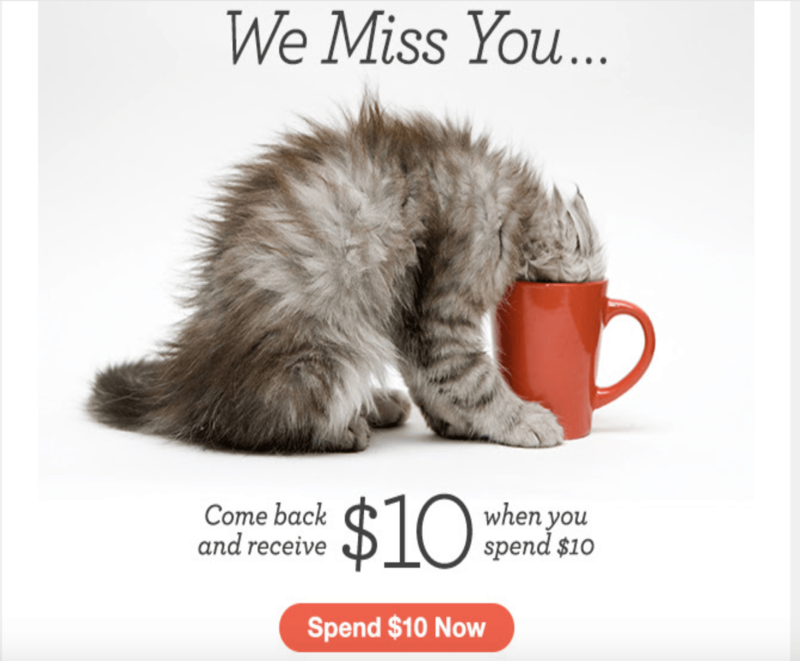 Here are some “we miss you” email examples to help inspire you to create the perfect winback email campaign. 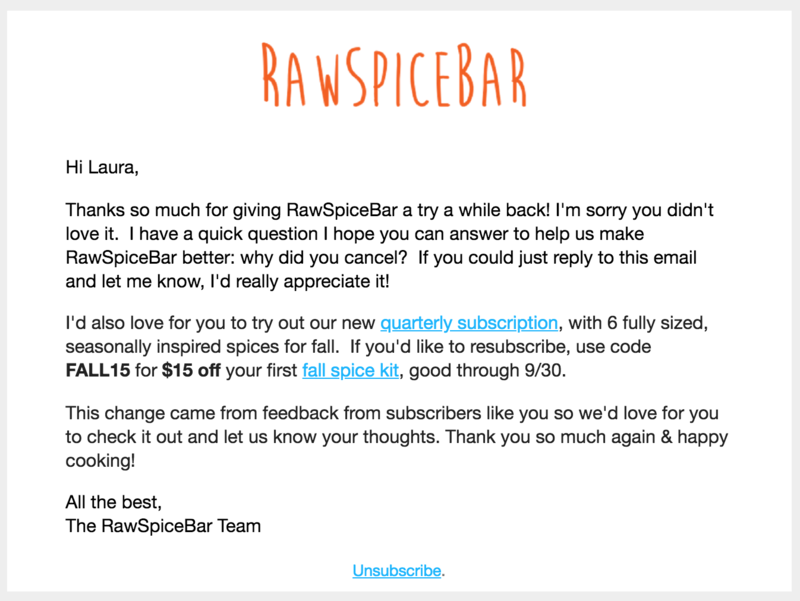 We love that Raw Spice Bar asked an open-ended question. GrooveHQ is an example of a company that grew their exit survey results by 785% using a simple open-ended question. They even A/B tested different ways of asking and found that “what made you cancel?” instead of “why did you cancel?” gave them better results. It’s interesting how a simple word change can make such a difference by sounding less confrontational. Thanks so much for giving RawSpiceBar a try a while back! I’m sorry you didn’t love it. 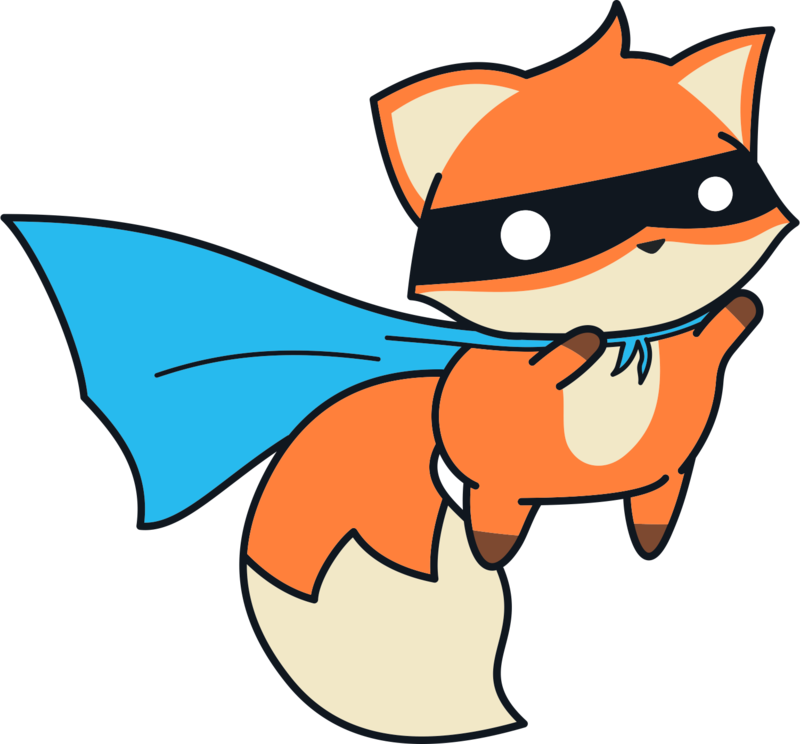 I have a quick question I hope you can answer to help us make RawSpiceBar better: what made you cancel? If you could just reply to this email and let me know, I’d really appreciate it. I actually remember when I first got this email in my inbox because I literally laughed out loud. 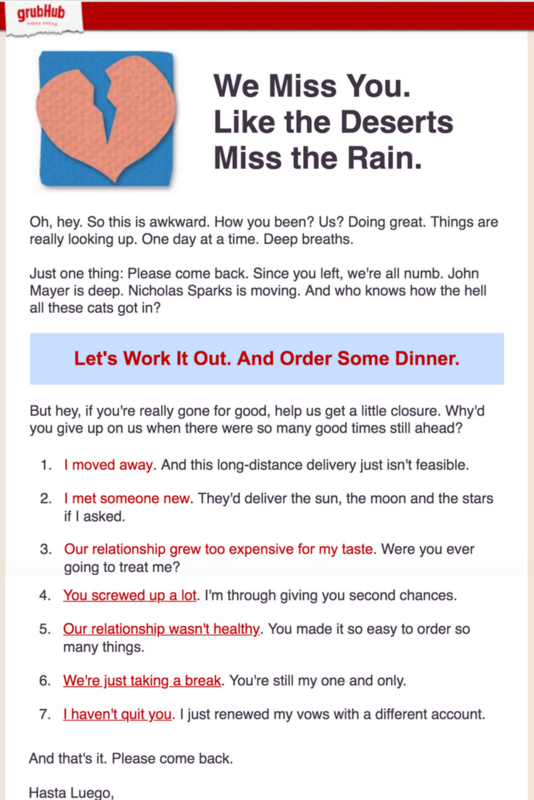 The email put a smile on my face and if it wasn’t for the fact that I moved away to a place that doesn’t have GrubHub, I probably would have ordered from them that day. The survey makes it simple to select which option was the reason for canceling, which is very convenient. I remember selecting the reason because, why not? It’s only a click away. However, they are missing out on some information. For example, if they added another step after I clicked on “I moved away,” they could find out where I moved to. This could then potentially help GrubHub figure out which markets could possibly be worth exploring. So there you have it, three “we miss you” emails to get your ideas flowing. Is there an email strategy that has worked for you in the past? If so, we’d love to hear about it in the comments below! 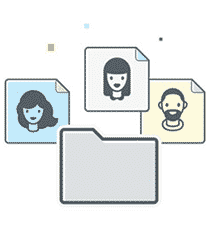 Customer feedback software coming end of 2018. Sign up for early access. 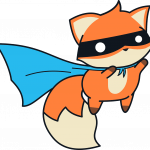 Get free product management tips and secret resources. Be the first to know when we post.